YPSA has been working for improving the transparency and accountability of the migration process. As well as informing the community on safe migration and facilitating on building the capacity of migrants to make informed choices. To reach the outcome of project YPSA has conducted numerous events and formed two groups as Grievance Management Committee (GMC) and Youth Volunteer Group. 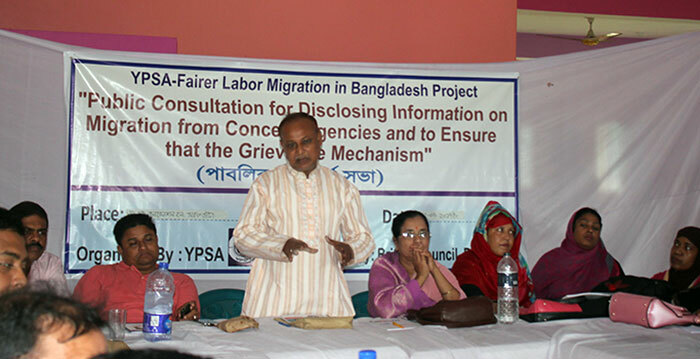 GMC making emphasis on settling the dispute or resolve complain on overseas related in out of BMET (Bureau of Manpower, Employment and Training) or formal court through social mediation.On the other hand, Youth are supporting GMC on conduction of social mediation and disseminating of fair migration steps and knowledge to community. Panel Mayor, Rangunia Paurashava called for preferring social mediation on settling the complaints on overseas. 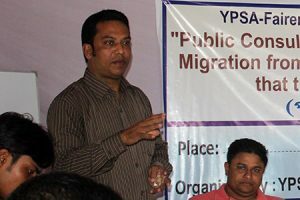 On 30 July 2017 YPSA has conducted a Public Consultation Meeting at Saraf Bhat Union, S. Hoque Convention Hall with the presence of about 60 people. The types of participants are local elected members, social leaders, NGO Official, Recruiting agency, aspirant migrant, returnee migrant, migrants family members, media people, political leaders, youth leader and GMC members. 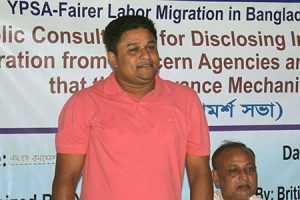 The objectives of this consultation meeting are to share the name and services of migration related organization (DEMO- District Employment and Manpower Office, ProbashiKollan Desk, Training Center, Union Digital Center, Regional Passport Office and Migration Support center), and function of GMC. And how do make more effective of Social Mediation through GMC. At the beginning of meeting Program Manager of YPSA-FLM has presented a power point presentation on objective and expected outcome of public consultation. He also shared the outstanding result of GMC. As GMC now solved five complains and 10 complaints are now under processing. Program Manager also shared the challenges and standards of social mediation. The meeting was participatory and interactive. After the presentation, an open discussion was held where GMC, Youth Volunteer, Social leader and Political Leaders were participated and made this discussion in rich and meaningful. At discussion GMC leaders suggested in mediation we should open and give scope to parties on clarifying the issues. Another GMC members said many cases we have to rigid and tactical. A youth leaders suggested that at mediation, mediators must be neutral. Program Manager of YPSA Abdus Sabur presents a multimedia presentation on Public Consultation Meeting Objectives and Outcome. After the open discussion, organizer made a special thanks to all participants. Finally concluding speech has given by RanguniaPaurashava Panel Mayor, Mr. Jalal. He called to prefer social mediation to settle the overseas related disputes. He also emphasis on maintain the norms of mediation and not to impose any party on settling the disputes.